Donald Lingo Jr. of Millsboro fought his way to third place in the Super Late Model race on Friday, June 29. The him he was referring to was Dale Hollidge. Hollidge had just denied Elliott a win on Georgetown Speedway’s high-banked, half-mile clay oval last Friday night. Not only did Hollidge, a resident of Mechanicsville, Md., deny Elliott the win, Hollidge also pocketed the $3,500 purse offered as part the speedway’s hosting of the “Clash for Cash” Super Late Model traveling series. Earlier this year, Georgetown Speedway joined other Mid-Atlantic racetracks hosting the Clash for Cash races, with large guaranteed purses that include a $3,500 share to the Super Late Model winner. Two more confirmed dates are on the 2018 Clash for Cash schedule. 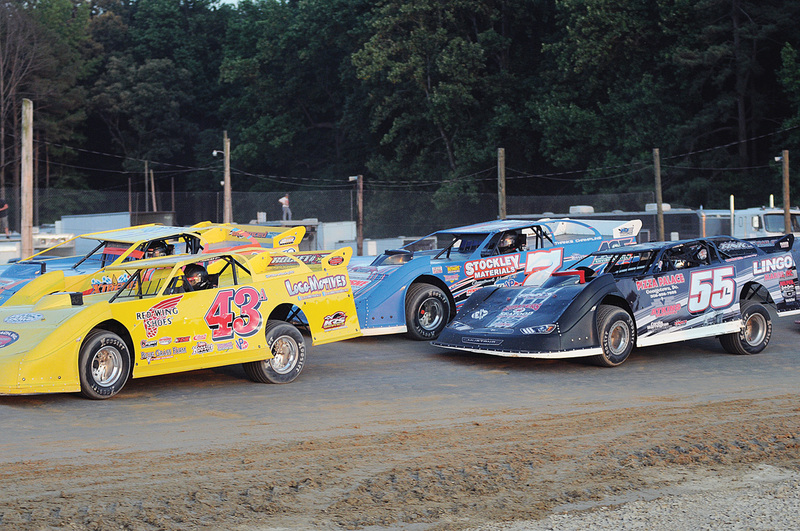 Their next stop will be at Bedford Speedway on Friday, Aug. 10. That Saturday, Aug. 11, they’ll end their season at Hagerstown Speedway. In last Friday’s 35-lap Super Late Model race, the early laps were fast and furious. From the pole, Hollidge hustled into the early lead and was never seriously challenged on his way to the checkers for his second Georgetown win of the season. Farther back, Millsboro native Donald Lingo Jr. was fighting his way to third. Lingo secured third and tried closing in on Elliott, who was busy trying to run down Hollidge in the final laps. Then, with just two laps left, the caution flag waved. When racing resumed, Hollidge rocketed away from the field, leaving the lead pack evenly spread out behind him and the rest of the field fighting for positions. Georgetown native Ross Robinson and Andy Haus rounded out the top five. Robinson said he had wanted to come away with two wins. While he did fall halfway short of that goal, he did win the Southern Delaware Vintage Stock Car feature, taking the checkered flag over C.J. Schemer, Jamie Eichotz, Charlie Moore and Freddy Brightbill for the top five. Vintage Sportsman racers competed with them. Jamie Eicholz was the race winner. Five other support classes also competed. After 20 laps of feature racing in the Rush Late Model class, the checkered flag waved for Georgetown local Matt Hill. Amanda Whaley was second under the final flag. Trailing Whaley in the top five were local David Pettyjohn, Billy Thompson and Zac Weller. Piloting a ’57 Chevy chassis powered by a powerful 602 sealed crate motor, Matt White won the Little Lincoln Stock Car Club feature, with last time’s winner Kirk Lawson chasing him under the checkers. Following Lawson in the top five were Landy Adams, Jordon Herbert and Brian Piercy. Laurel resident Dale Elliott led the Delaware Super Truck racers across the stripe. Following in the top five were Noah Vincent, David Smith, Kirk Miles Jr. and Corey Sapp. Jerry Barker, of Bloxom, Va., beat Geoff Carey to the Delmarva Charger’s checkers. Robert Paczkowski ran third, and was followed by Chris Martinez and Ashley Merritt. This week, Georgetown Speedway will present the Monster Truck Racing League “Monster Truck Madness” featuring BigFoot, Tough Trucks and more. Gates open at 4 p.m., and a Pit Party will be held from 5 to 6:30 p.m. The Monster Truck Madness begins at 7 p.m.